This document is a technical summary of the Federal Highway Administration report, Guidebook on Identification of High Pedestrian Crash Locations, Report No. FHWA-HRT-17-106. One of the U.S. Department of Transportation’s top priorities is the improvement of pedestrian and bicyclist safety. The Federal Highway Administration (FHWA) promotes safe, comfortable, and convenient walking for people of all ages and abilities. Part of this effort has been to encourage a data-driven approach to identifying and mitigating safety problems. An initial step in reducing the frequency of pedestrian crashes is identifying where they occur or where there is a concern that they are likely to occur. As part of an FHWA project, the Guidebook on Identification of High Pedestrian Crash Locations was developed to assist State and local agencies in identifying high pedestrian crash locations, such as intersections (points), segments, facilities, and areas. (1) The process of identifying high pedestrian crash locations resulted in a prioritized list of potential locations on the roadway system that could benefit from safety improvement projects. Several cities and States were contacted to determine the criteria they used to identify and rank high pedestrian crash locations. In all cases, crash data were being used. In some cases, other variables were considered, especially when developing the list of sites for treatments. For example, Los Angeles used a score that considered the age of the pedestrian and a health and equity index in addition to the number of injury crashes and the number of fatal crashes. Several of the cities created unique lists for intersections, facilities, and areas, recognizing that treatment selection would be different for these element types. Select approach. The Guidebook focuses on the traditional (also known as reactive) approach. If a proactive approach is preferred, the Guidebook gives suggestions about other references. Gather data. The typical data needed consist of crash data (including severity, crash type, contributing factors, and importantly, the location of the crash, preferably stated as latitude and longitude coordinates) and roadway characteristics (e.g., the number of lanes or traffic control devices present). Exposure data in the form of vehicle counts, pedestrian counts, and/or turning and crossing movement counts for specific locations may also be desired. Plan assessment. The substeps within this step are to select the scale (e.g., intersection, segment, or area), performance measures (e.g., crash frequency or crash rate), and the screening method (e.g., a simple ranking or a more complex approach that requires a software application). Conduct assessment. Several tools are available to assist in conducting the assessment, with most having data in addition to crash data. Some of the tools may require additional training or a skill set in geographic information systems (GISs) before an assessment can be conducted. Prioritize locations. 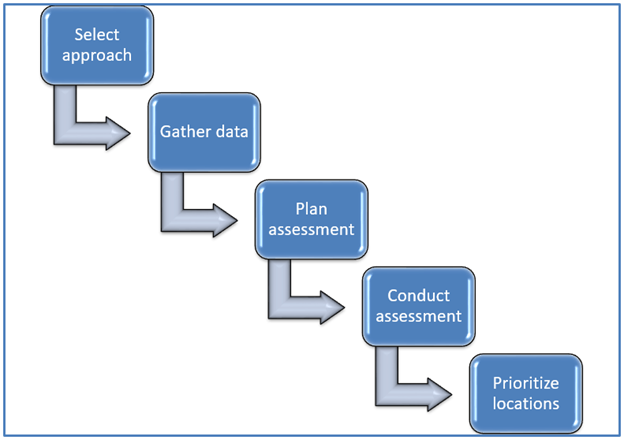 After the selected performance measure(s) and screening method(s) are applied to the study network, the resulting list of sites can be arranged using a simple ranking or by considering adjustments or community priorities. Supplemental Material A—Example of Safety Index: provides additional details regarding the index the City of Los Angeles uses. Supplemental Material B—Screening Method Examples: presents examples of several screening methods. Supplemental Material C—Online Maps: presents several examples of online maps being produced by numerous city and State departments of transportation to show pedestrian crash data. Supplemental Material D—Advice from Previous Studies: discusses several previous studies that have documented analyses to identify high crash locations along with different approaches to identify and rank locations. Supplemental Material E—Glossary: provides a list of definitions relevant to this document. Figure 1. Steps to identify high pedestrian crash locations. Most agencies now have the geographic coordinates of crashes, making it possible to quickly demonstrate visually where crashes are occurring. Each of the interviewed agencies uses a GIS to identify high crash locations. The agencies generally start with identifying high crash intersections and then group the intersections. GIS tools aid in the grouping; however, several agencies noted that visually confirming the grouping is how they set the limits for their corridors and areas. Agencies have considered surrogates, such as activity centers, walk scores, or citizens’ comments, to identify locations of concern. Pedestrian-exposure data were typically not used to identify sites because of the lack of good data for significant portions of their network. The analysis period ranged between 1 and 3 yr. The agencies noted that pedestrian and bicycle crashes are different from motor-vehicle crashes and require unique efforts. Analysts with the needed skill set are necessary. Partner agencies that share data are better informed and can develop their program more efficiently and effectively. Agencies with access to reliable geographic coordinates for crashes can more accurately locate their crashes. Agencies with strong support from others within the city can develop and implement stronger programs. Some of the cities suggested that the list of sites and plans should be shared with the public so residents know where the city is performing work and how those decisions were made. Use several methods to rank sites to ensure consensus. Consider pedestrian-exposure data in some manner, otherwise this could significantly affect results. Consider other measures (e.g., walkability score) along with crash data since crashes are rare events. Use a minimum segment length if evaluating segments (suggested to be at least 0.2 mi). Consider employing a longer period in the evaluation of pedestrian crashes due to the relatively small number of reported pedestrian crashes (e.g., 5 yr rather than 3 yr). The availability of geographic coordinates (latitude and longitude) for crashes has resulted in the ubiquitous use of GIS platforms for displaying the locations and densities of crashes on maps. Certain map displays more successfully convey crash density. For example, use of larger symbols or color-coded symbols (e.g., a green–yellow–red scale) seems to be most appropriate for quickly identifying high crash locations. In most cases, showing symbols for individual crashes does not display well because the crash symbols overlap on the map. Map displays with zoom capability can be used to quickly identify high crash areas at a citywide scale yet still provide the option to view individual crashes at a particular intersection or street. Maps that display additional information once clicked are ideal for exploring crash patterns or attributes at a detailed level. Several different approaches are used to identify and display high crash locations, and often, these approaches are not well documented in the mapping application. In some cases, the mapping software application automatically determines how to group nearby crashes based on view level. In other cases, agencies predetermine how nearby crashes will be grouped and displayed in the mapping software. Recent advances in statistical techniques have provided several methods and tools, other than reviewing crash data, that can be used to identify locations with concerns for pedestrians. These techniques include safety performance functions, the Highway Safety Manual,and systemic analyses. (2) These techniques provide the opportunity to allow comparisons between a city’s data and national trends. The growth of better statistical techniques also permits the profession to better handle regression to the mean and low sample challenges. Fitzpatrick, K., Avelar, R., and Turner, S. (2018). Guidebook on Identification of High Pedestrian Crash Locations, Report No. FHWA-HRT-17-106, Federal Highway Administration, Washington, DC. AASHTO. (2010). Highway Safety Manual, AASHTO, Washington, DC. Researchers—This study was performed by Principal Investigator Kay Fitzpatrick along with Raul Avelar and Shawn Turner. For more information about this research, contact Dr. Kay Fitzpatrick, Texas A&M Transportation Institute, 2935 Research Parkway, College Station, TX 77845-3135, k-fitzpatrick@tamu.edu. Availability—This TechBrief may be obtained from the FHWA Product Distribution Center by email to report.center@dot.gov, fax to (814) 239-2156, phone to (814) 239-1160, or online at http://www.fhwa.dot.gov/research. Key Words—Pedestrian, crashes, safety process, high crash locations.